The National Ski Areas Association (NSAA) announced that US ski areas tallied an estimated 53.3 million skier and snowboarder visits during the 2017-18 season, down 2.8 percent from last season’s 54.8 million total. The annual skier visit count, an important industry metric, was released today at the NSAA Convention and Tradeshow being held this week in Marco Island, Fla. This past season, ski areas in the Midwest experienced an impressive rebound, as skier visits grew by 17 percent in this region to 6.4 million visits. In addition, the Southeast region had a strong season, up 3.6 percent to 4.3 million visits from 2016-17. The Northeast region held steady at 11.8 million visits, less than 1 percent down from the previous season. The Rocky Mountain, Pacific Northwest, and Pacific Southwest regions were down slightly more, ranging between -5 and -14 percent. Visitation was up more than 52 percent in October and November and up 18 percent in March, due to a strong start and finish to the season. Resorts in several states set records for skier visits, including Whitefish and Bridger Bowl in Montana; Stevens Pass in Washington; Jackson Hole in Wyoming; and Schweitzer Mountain in Idaho. Resorts were open an average of five additional days this season over the prior season—a testament to the investments in efficient snowmaking infrastructure and a commitment to providing an outstanding experience to guests. Thanks to abundant snowfall totals late in the year, two resorts in Michigan—Boyne Mountain and Mount Bohemia—have been competing since mid-April to see which can stay open the longest this season. Notably, the share of visits that included a lesson at US ski areas increased this season, indicative of the growing appetite to learn to ski and snowboard. These activities provide terrific opportunities to get outside in the winter and spend time with family and friends. NSAA will release a final report of the Kottke End of Season Survey this summer. To order a copy of the report, visit NSAA online at www.nsaa.org. The National Ski Areas Association (NSAA) has presented its 2018 Lifetime Achievement Award to Jerry Blann, the former longtime president of Jackson Hole Mountain Resort, Wyo. Blann received the ski industry’s highest honor at a special awards presentation today at NSAA’s National Convention and Tradeshow, which is being held this week in Marco Island, Fla.
Blann has been one of the most influential and accomplished leaders in the ski industry’s history, building and defining the iconic western destination ski resort experience. His fascinating background, stunning successes at both Jackson Hole and Colorado’s Aspen Mountain, and his dedication to the industry and NSAA, makes Blann long overdue for our industry’s most prestigious recognition from his immediate peers. The ski business is in his blood. His father, Cliff, spent 25 years as general manager of the then newly created Mt. Bachelor ski area in Oregon, where both Cliffhanger and Cliff’s Run are named in his honor. As a 10 year old, Jerry’s first job was painting new lift towers for his dad, and by 14, he was blasting tree stumps and cutting new trails. Even his younger brother, Casey, has likewise succeeded in the family business, serving in senior management roles at Heavenly Mountain Resort, Sierra-at-Tahoe, and Kirkwood, Calif. Today, Casey is the senior vice president of mountain operations at Alpine Valley. After cutting his teeth at Mt. Bachelor, Blann received a skiing scholarship to Denver University’s famed ski team—in his four years on the team, DU won the NCAA national championship three times. By his senior year, he was captain of the ski team, named an NCAA All-American, and honored as DU’s overall Outstanding Athlete of the Year. After earning his business degree, Blann was offered a prestigious management training position at Aspen Mountain. By 36, he had worked his way up to become the president of Aspen, one of the most heralded ski resorts in the world. After 18 years leading Aspen, he became president at Bear Mountain in Southern California for four years, before leaving to develop Lake Catamount ski community south of Steamboat, Colo., in the early 1990s. When Jackson Hole was purchased by Jay and Connie Kemmerer in 1993, the family quickly hired Blann to be president. At that time the resort was barely averaging 200,000 skier visits. Working closely with the Kemmerer family, Blann and his team drove exponential growth at the resort, while also preserving its independent, iconic western flavor and commitment to guest services. In Blann’s 23 years as president, skier visits have on average tripled to more than 600,000. Under his leadership, JHMR dramatically expanded its investment in new infrastructure, replacing its legendary aerial tram in 2008 (to the tune of $31 million), adding the new Sweetwater Gondola and Teton high-speed quad, as well as the beautiful Rendezvous Lodge. The resort also developed the first via ferratta rock challenge course at a US ski area (and the first approved by the Forest Service). In total, Blann oversaw more than $200 million in resort investment during his tenure. While JHMR has long been known for its “high testosterone terrain,” as Blann puts it, his team has worked to significantly broaden the variety of terrain to appeal to a rapidly growing guest demographic. In fact, just this season, Jackson Hole set a record, with more than 730,000 skier visits—nearly four times the number of visits when Blann took over in 1993. The culmination of Blann’s transformation of the mountain has been the unending awards and recognition for JHMR. Forbes magazine has named Jackson Hole the number one ski resort in North America for seven years in a row (you read that right)—an unbroken record dating back to 2011. And in 2013, knocking off some perennial resort winners, Jackson Hole seized SKI Magazine’s prestigious number one ranking of North American ski areas, as voted by the magazine’s readers. Importantly, Blann’s leadership helped protect Jackson Holes rugged independence and iconic stature, amidst a tumultuous period of heavy resort consolidation around the country. Blann has also been especially crucial to NSAA, where he served on its board of directors and spent 10 years as the chairman of NSAA’s Environmental Committee. In 2000, Jackson Hole became a founding member of NSAA’s Sustainable Slopes environmental charter. In 2011, JHMR received NSAA’s prestigious Golden Eagle Award for best overall sustainability. Blann’s ability to work closely with other business and political leaders has been vital for JHMR, including his involvement with the influential Wyoming Business Council and numerous other community and state business groups. As president of Jackson Hole’s Airport Board for 18 years, Blann significantly expanded the airport’s rapid growth (tripling its capacity under his leadership), with 14 non-stop flights into Jackson from all over the country, in turn driving the resort’s expansion. Notably, in 2017, Blann led the drive to enact Wyoming’s Ski Safety Act, rallying the 10 ski areas in the state to rewrite the state’s impotent and ineffective recreation law. Testifying before the legislature and working with politicians behind the scenes, he used both his charisma and business insights to make Wyoming the 29th state to enact specific ski safety legislation governing the inherent risks of skiing, providing critical legal immunity to all of the ski areas in the state. “I would be surprised if any ski resort president has done more for a mountain resort than Jerry has over these last 23 years,” said Matt Mead, Wyoming’s governor. Our industry loudly echoes those well-deserved sentiments. Congratulations to Jerry Blann, recipient of NSAA’s 2018 Lifetime Achievement Award, for his astonishing success, leadership, and commitment to our industry. Snowbasin Resort in Utah is the winner of the 2018 National Ski Areas Association (NSAA) Conversion Cup Challenge, sponsored by HEAD Wintersports. 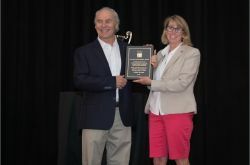 This annual award recognizes resorts across the country that have developed outstanding programs to convert new skiers and snowboarders into lifelong enthusiasts. Snowbasin was selected among a strong field of ski areas from across the US. The other two finalists were Boreal Mountain Resort in California and Les Sommets in Quebec, Canada. 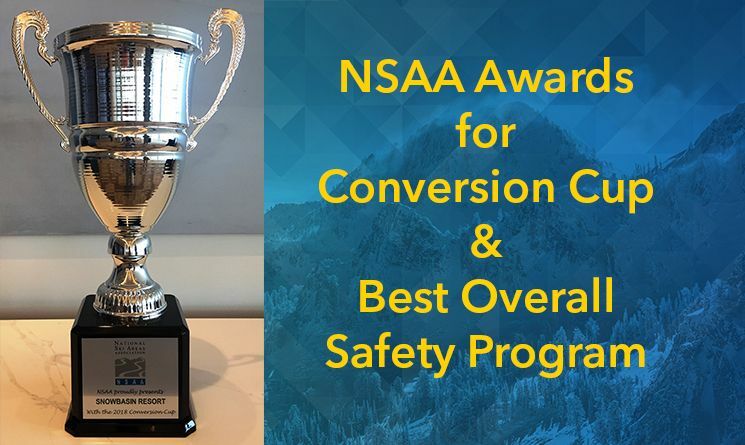 NSAA launched the initiative in 2010 as a way to pique competition among member ski areas and recognize those who make significant strides to boost conversion rates. The winner is chosen based upon proven results, creative ideas, consistent execution, and long-term commitment to the conversion effort. Several key metrics are used in the judging process, including beginner lesson volumes; quantifiable success of beginner lesson packages; season-to-date sales and repeat sales data collection; and marketing ingenuity and use of new media. Snowbasin won the honor largely based on the success of its Learn & Earn Program, which is focused on instilling a sense of inclusivity among newcomers and creating lifelong participants in snowboarding and skiing. The three-year program, introduced in 2016-17, provides a road map and incentives along the way to becoming a core participant. Year one of Learn & Earn includes three all-day group lessons, seasonal rental of ski or snowboard equipment, and a season pass upon completion of the third lesson. In the fall, guests are invited to the resort to get fitted for equipment, meet the instructor staff, become familiar with the resort, and get answers to any questions they may have. One hundred percent of last season’s Learn & Earn participants finished all three lessons, while this season’s results show an 81 percent completion rate as of mid-February 2018, when the resort submitted its award application. Graduates of the year one Learn & Earn program are eligible for the year two program—Learn, Earn & Return—which consists of three additional group lessons, a season pass, and purchase of their own equipment—all for $499 (youth price) or $599 (adult price). A remarkable 71 percent of last season’s never-evers purchased the Learn, Earn & Return program or bought their own season pass this past winter. Year three of the program (the 2018-19 season) will continue the momentum with a premier season pass, a private lesson, and numerous other special perks. One unique component of Snowbasin’s application is that the youth Learn & Earn program is offered in partnership with the Davis County Education Foundation, which provides financial support to the public school district in nearby Davis County. A portion of the profits from Learn & Earn are donated to the Foundation. 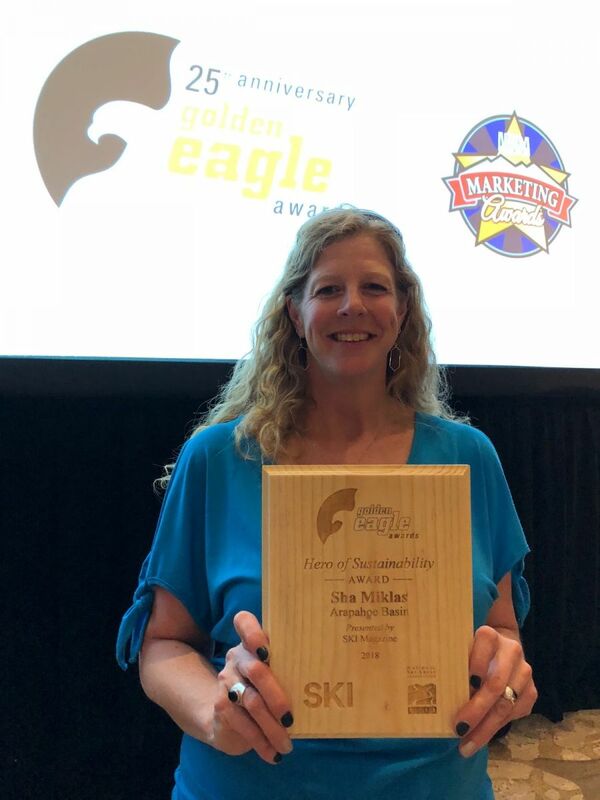 SKI Magazine has honored three ski areas—Bear Valley Mountain, Calif.; Crystal Mountain, Mich., and Boreal Mountain, Calif.—with 2018 Golden Eagle Awards. 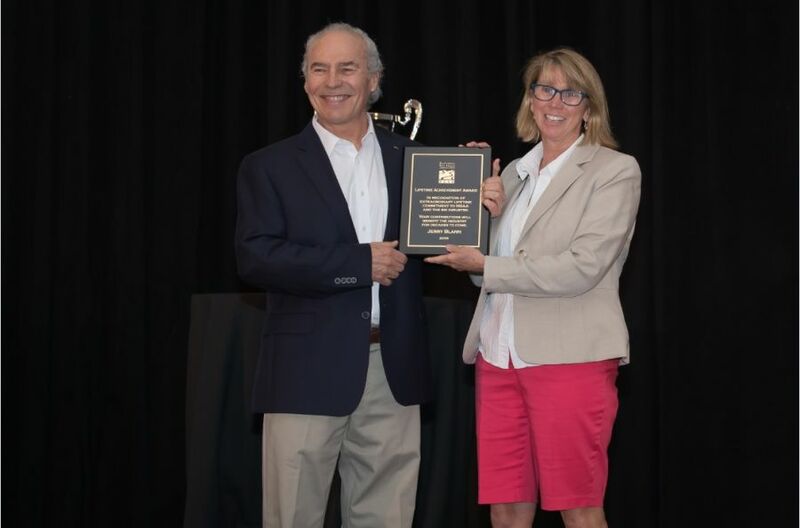 In addition, SKI named Sha Miklas of Arapahoe Basin Ski Area, Colo., as the “Hero of Sustainability” honoree for 2018. The awards, sponsored by Safehold Special Risk, recognize exceptional resort initiatives to educate guests and employees about skiing and snowboarding responsibly. Squaw Valley | Alpine Meadows, Calif. The winning programs will be highlighted in the summer issue of the NSAA Journal. The awards are sponsored by Inntopia, a strategic marketing, commerce, and business intelligence firm based in Stowe, Vt. Judges for the awards were Mike Bisner, vice president sales/East for AXESS NORTH AMERICA; Ryan Davis, art director of Portland, Oregon-based branding agency Nemo Design; and Matt Neren, founder and partner of Boulder, Colorado-based Cultivator Advertising & Design. An in-depth review of the winning marketing award programs will be included in the summer issue of the NSAA Journal.